The PC-OPC Server uses the OPC standard interface to allow third-party, OPC-compatible graphics packages to view data from the LoggerNet server. This software provides a simple browser interface that allows you to easily select the values you want to display. It also allows you to view input locations, final storage data, and LoggerNet communications server statistics, as well as perform control operations. Many software and hardware products support OPC. Products that have been tested by Campbell Scientific include Iconics Genesis, Intellution IFIX, and National Instruments Lookout. A PC-OPC trial version can be downloaded at no charge. The trial version generates random data instead of retrieving the data. The purchase of the single license allows you to install and use a single instance of the software on one physical computer or one virtual machine only. This software cannot be loaded on a network server for the purposes of distribution or for access to the software by multiple operators. If the software can be used from any computer other than the computer on which it is installed, you must license a copy of the software for each additional computer from which the software may be accessed. If this copy of the software is an upgrade from a previous version, you must possess a valid license for the earlier version of software. You may continue to use the earlier copy of software only if the upgrade copy and earlier version are installed and used on the same computer. The earlier version of software may not be installed and used on a separate computer or transferred to another party. This software package is licensed as a single product. Its component parts may not be separated for use on more than one computer. You may make one (1) backup copy of this software onto media similar to the original distribution, to protect your investment in the software in case of damage or loss. This backup copy can be used only to replace an unusable copy of the original installation media. This software may not be sold, included, or redistributed in any other software or altered in any way without prior written permission from Campbell Scientific. All copyright notices and labeling must be left intact. Data Access Standard Supports Data Access Standard 2.05a only. Requirement Licensed copy of LoggerNet or LoggerNetAdmin must be running on the same PC or a remote PC that is accessible via TCP/IP. CR10X (retired) LoggerNet is compatible with the mixed array, PakBus, and TD operating systems. CR23X (retired) LoggerNet is compatible with the mixed array, PakBus, and TD operating systems. CR510 (retired) LoggerNet is compatible with the mixed array, PakBus, and TD operating systems. Requires a licensed copy of LoggerNet running on the same PC or a remote PC that is accessible via TCP/IP. Many software and hardware products support OPC. Products that have been tested by Campbell Scientific include Iconics Genesis, Intellution IFIX, and National Instruments Lookout. PC-OPC supports Data Access Standard 2.05a only. Minimum recommended hardware is 300 MHz Pentium II processor with 128 Mbyte of RAM and screen resolution of 800 x 600. Recommended computer operating systems are Windows Vista, 2000, and XP. Which version of the OPC DA specification does the PC-OPC Server work with? The PC-OPC Server works with OPC Data Access Specification 2.05a. What does the demo version of PC-OPC do? The PC-OPC Server demo enables users to verify if an OPC client will work with Campbell Scientific’s OPC server. The trial version doesn't actually connect to a LoggerNet server or provide any true data. It only provides mock data. What is an alternative to the PC-OPC Server? If the OPC client software supports getting data from an SQL server, LoggerNet Database Software (LNDB) may be a more appropriate option than PC-OPC. LNDB stores a complete history of data tables retrieved from the data loggers in an SQL server. In contrast, PC-OPC only provides the last record from each data table in the LoggerNet cache when it is first started and any new records that are collected by LoggerNet while the PC-OPC Server is running. If the OPC client is storing PC-OPC data in its own database, gaps will be created (missing data) in the OPC client database if the PC-OPC Server, the OPC client, or both are not running when LoggerNet collects the data. Using LabVIEW, can communication be established with a data logger? Campbell Scientific data loggers cannot communicate directly with LabVIEW. However, after retrieving data collected by any of the Campbell Scientific data loggers and placing the data in the LoggerNet data cache, the data can be shared with LabVIEW using a LoggerNet client called PC-OPC. 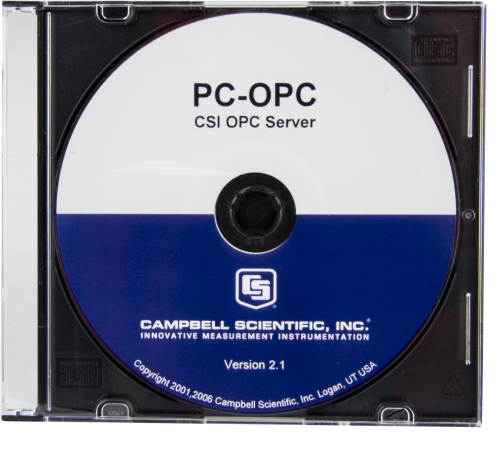 A trial version of PC-OPC is available in the Downloads section of the PC-OPC product page. The PC-OPC Server software provides a standard interface that allows third-party OPC-compatible graphics packages, including LabVIEW, to display the data logger data. In addition to using the PC-OPC Server and the data socket feature in LabVIEW, communication can also be established using LoggerNet-SDK with ActiveX controls.